A private firm had been given the contract for repair and rehabilitation of sewerage in the area. On October 21, a 32-year-old labourer, Dooman Ray, died while cleaning a Delhi Jal Board sewer in Jahangirpuri region of Northwest Delhi. It was revealed during the investigation that Ray was working in a sewer with three other workers. Around 5:30 am on Sunday morning, he went down into the sewer hole to open the valve, and drowned in the water that gushed from it, indicated the preliminary investigation. "The Delhi Jal Board (DJB) has given the contract to KK Spun India Ltd for repair and rehabilitation of sewerage in Jahangirpuri,” said A K Lal, Additional Deputy Commissioner of Police (Northwest), Delhi. He also said that the firm has been booked under sections of Prohibition of Employment as Manual Scavengers and their Rehabilitation Act, and also for causing death by negligence. Ray, who was a native of Katihar, Bihar, was rushed to the Max Hospital in Shalimar Bagh, where he was declared dead. The police are awaiting a postmortem examination. Delhi Jal Board has issued a statement saying that the officials are looking into the matter. "The DJB is extremely sorry to hear about the loss. The matter is being looked into, and action will be taken accordingly," the statement said. 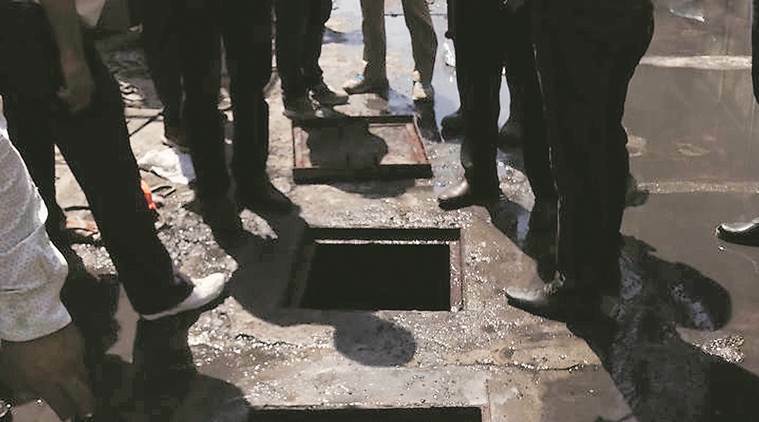 In September, five men lost their lives after inhaling toxic fumes while cleaning a sewage treatment plant in West Delhi’s Moti Nagar area. Before that, in the month of August, another worker died while cleaning a sewer tank at the Lok Nayak Hospital, New Delhi. Recently, it was found in a survey conducted by Rashtriya Garima Abhiyan (RGA) – an NGO, in collaboration with Union Ministry of Social Justice and Empowerment, that FIRs are filed in only 35 per cent of sewer deaths, and the affected families receive any compensation in only 31 per cent of the cases. The sample study of deaths due to sewer and septic tank cleaning since 1992 showed that none of the cases led to any trial or prosecution. The survey, conducted for an ongoing manual scavenging census, covered a sample group of 97 deaths in 51 incidents across 11 states. The ministry reported more than 323 deaths nationwide in the year 2017. It was also revealed in the survey that the death rate was the highest, a staggering 37 per cent, among workers in the age group of 15-25 years. The death rates were 35 per cent and 23 per cent among the age groups 25-35 and 35-45 respectively. A survey conducted by Safai Karmachari Andolan (SKA), a national movement committed to the total eradication of manual scavenging, pointed out that there have been more than 1,300 deaths due to manual scavenging across the country in last 10 years. Swachh Bharat: BJP’s Biggest Jumla? We travelled to Kusumpur Pahadi, Delhi to see the ground realities of Swachh Bharat, one of the most ambitious schemes of the Modi government.